In order to use shipping rates, you must first select your shipping mode. There are three shipping modes detailed below. 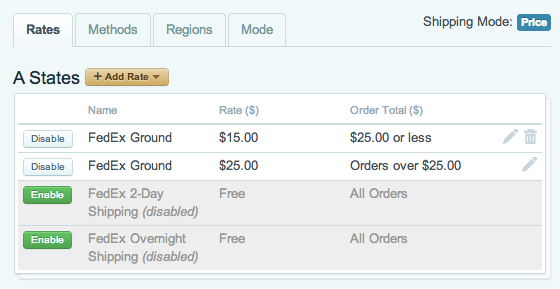 The Free Shipping mode is selected by default when you first create your store. There are no configuration options for this mode. When a customer visits your store they will not be able to select any shipping options, but it will automatically show up as $0.00 for shipping in the cart and order summary. When you first select the Weight-Based Shipping mode, you will see a dialog box that warns you that all shipping rates will be deleted. Since this is the first time selecting this option, just click "OK" to proceed. NOTE: If you have previously defined rates for Price-Based Shipping, these will be deleted! Previous shipping methods and regions will still stay intact. Once you select "OK", Cart66 will automatically create a Ground method as well as an Express method. Both of these are currently disabled. If you have already created methods within Cart66, these will appear instead. 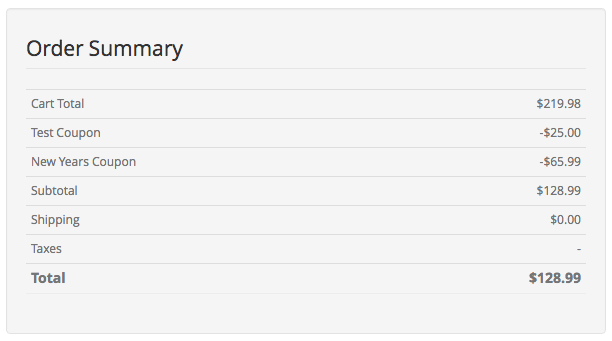 You can enable any of these rates, or create your own. These rates are based off of a default region called "The World". This just means that anyone, anwhere will receive these rates regardless of their location. 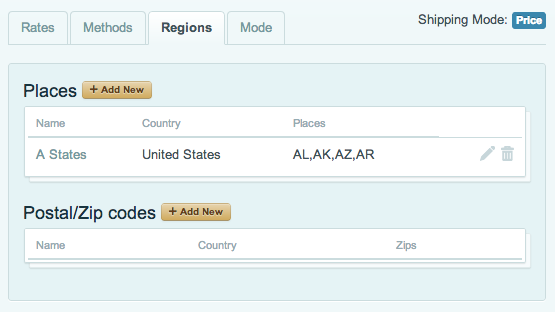 To specify specific regions, click on the regions tab. You will be presented with two options, "Places" and "Postal/Zip codes". To add a shipping region for a place, just click on the "Add New" button next to the Places title. From there, you can select a country that you would like this region to be set to, and set a specific state, province, or territory depending on your selected country. You can also set a name for this region. Click Save to update your changes. 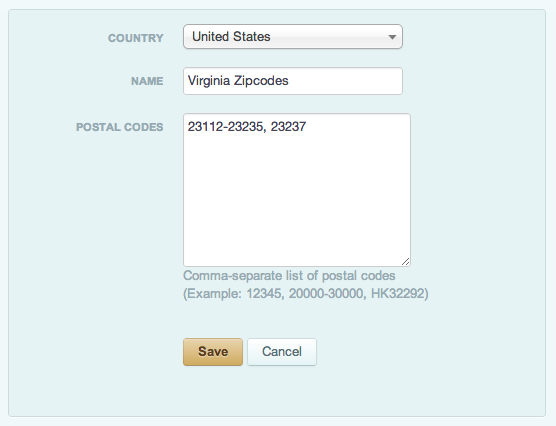 To add a shipping region for a Zipcode, just click on the "Add New" button next to the Postal/Zipcode title. 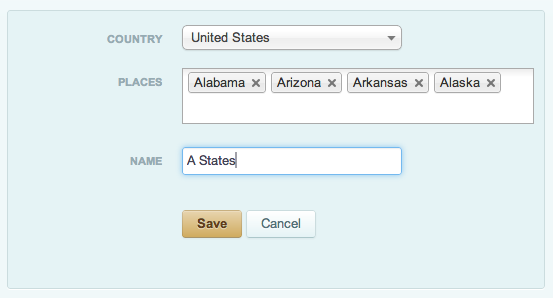 From there, you can select a country that you would like this region to be set to, and enter in comma separated zipcodes. You can enter in individual zipcodes (23237) or enter in a range of zipcodes (23112-23235). You can also set a name for this region. Click Save to update your changes. 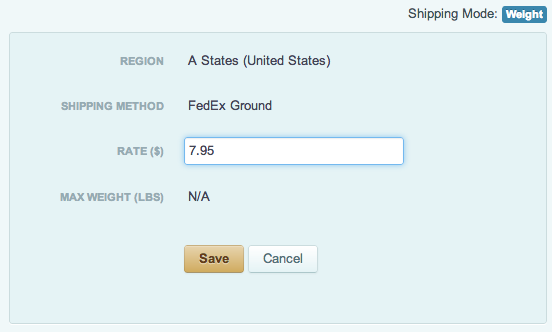 You can also create individual shipping methods to apply to shipping rates. You can use the default Cart66 methods of "Ground" and "Express", or you can create your own. Just enter the name of the method in the method box and click "Save". You can always rearrange the order of the shipping methods by using the up and down arrows on the left side of each method. Once you have created your methods, you can go back to the "Rates" tab and enable/disable individual methods for each region. 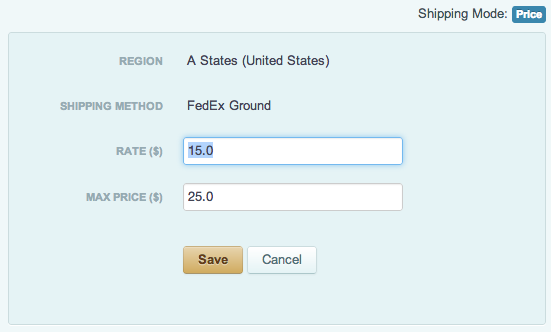 Once you have enabled the shipping rate for your selected region, you will need to click on the edit icon to change the rate from the default "Free". When you select the edit icon, you can then set the amount that will be applied to that rate. If you want to apply different rates for the same shipping method to specific cart weights, just add in another rate for that specific method by clicking on the "Add Rate" option and select the method you want to add another rate to. You can then add in the maximum total cart weight you want this rate to apply to. Once saved, your rates will display similarly to the image below. When you first select the Price-Based Shipping mode, you will see a dialog box that warns you that all shipping rates will be deleted. Since this is the first time selecting this option, just click "OK" to proceed. NOTE: If you have previously defined rates for Weight-Based Shipping, these will be deleted! Previous shipping methods and regions will still stay intact. To specify specific regions, click on the regions tab. You will be presented with two options, "Places" and "Postal/Zip codes". If you have already created regions, they will be listed here. If you want to apply different rates for the same shipping method to specific cart prices, just add in another rate for that specific method by clicking on the "Add Rate" option and select the method you want to add another rate to. You can then add in the maximum total cart price you want this rate to apply to.